This radish kimchi, made with gorgeous purple daikon radishes and vivid red Korean chile powder, sits in quart-sized jars on my countertop, bubbling and fermenting. 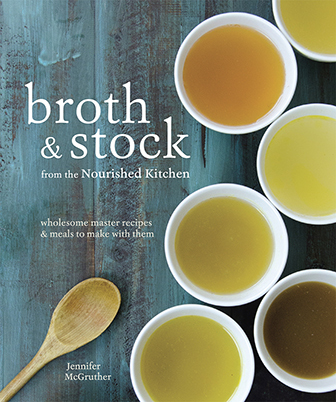 It’s a vibrant food, wild and raw and vibrant with flavor. Traditionally, cooks prepare radish kimchi (kkadugi) by cubing daikon radish before salting, seasoning and fermenting the radish until pleasantly sour. While I like the pleasant, crisp crunch of traditionally prepared radish kimchi, I prefer the visual appeal of thinly sliced disks of daikon radish packed in a jar and covered in the vivid red paste of chile, salt, ginger, garlic and green onion. In Korea, the autumn harvest marks the days of the radish harvest and farmers and home cooks traditionally prepare radish kimchi at that time from the fresh, juicy roots pairing them with gochugaru, traditional Korean chile pepper, and other seasonings. 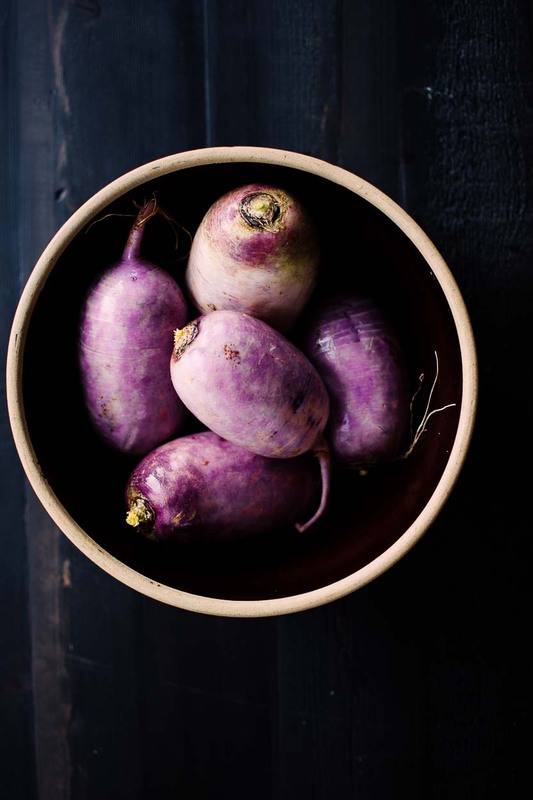 As with other fermented foods, you’d traditionally prepare radish kimchi in huge volumes, packed away in stoneware crocks where you’d allow them to ferment for months in an evenly cool environment, like a fermentation nook tucked away in the ground. Of course, you don’t need to wait until autumn (spring daikon work just fine). You don’t need to make large volumes (unless you like! ), and neither do you need to bury your kimchi in a crock underground. 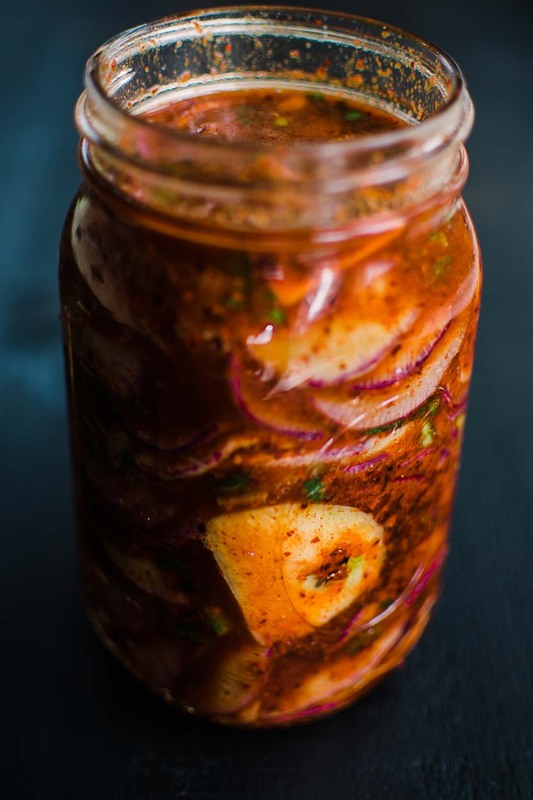 Instead you can make just a quart, and seal it with an airlock, and allow your kimchi to ferment out of direct sunlight for a few weeks until marvelously complex with just the right punch of heat and acidity. Radish kimchi is traditionally served as a side dish, among many side dishes, on the Korean dinner table. You might serve it with Seollongtang, a Korean Ox Bone Soup, or with Galbitang, a Korean Beef Short Rib Stew. In both these dishes the acidity and heat of Radish Kimchi helps to cut the richness of beef. If you’re not a traditionalist, you might serve it alongside eggs in the morning where its acidity, heat and ever-so-slight sweetness add a bit of complex brightness. It’s also nice served with rice over steamed vegetables and stir-fried meat. Or even over sausages, just as sauekraut is served, where it helps to cut the richness of meat. Serve a little at time, just a condiment size of a few tablespoons or a few slices of radish. Too much will overpower your meal, and too little will leave you wanting. Like all fermented and cultured foods, kimchi is an excellent source of beneficial bacteria – those little tiny microbes that help to support your immune system and build up your digestive system health. Kimchi has some pretty amazing properties owing to those microorganisms. Researchers have found that it’s these organisms that are likely responsible for kimchi’s anticancer, antiobesity, and antioxidative effects (read more about it here). Combine all ingredients in a medium-sized mixing bowl. Stir gently until the gochugaru and salt evenly coats the vegetables. Cover the bowl, and allow them to marinate in the salt until the daikon releases its juice, about 2 hours. 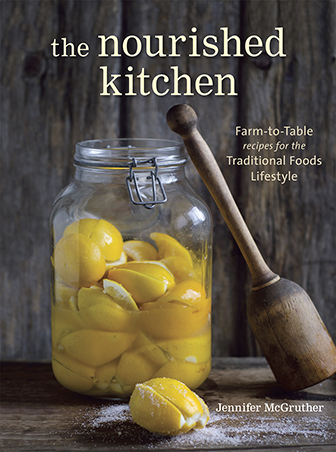 Pack the contents of the bowl tightly into a quart-sized mason jar, pressing firmly down as you go to allow air bubbles to escape and to fully fill the jar, and so that the brine covers the vegetables. Weigh down the vegetables with a glass weight (like this), and then seal the jar with an airlocked lid like this. Allow the daikon to ferment for 2 weeks, and then transfer to the refrigerator. To ferment vegetables safely and to minimize the risk of cross-contamination by molds or yeasts, you must keep the vegetables submerged in brine. Optimal vegetable fermentation is also an anaerobic process; that is, vegetables ferment best in an environment that is deprived of oxygen. 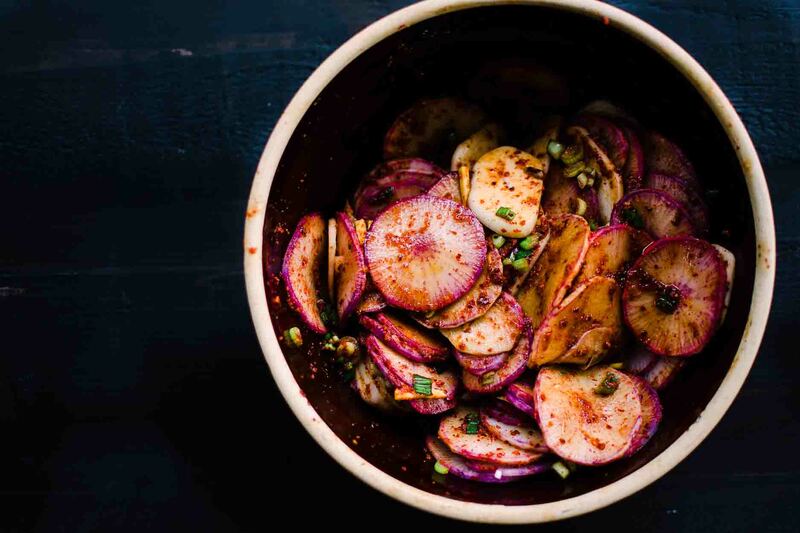 To prepare this kimchi recipe safely and to achieve optimal results, you’ll need to weigh your radish and other seasonings down so that they remain submerged in brine. These glass weights help to keep vegetables submerged when you’re using mason jars. This airlock fits on top of a mason jar, and it allows for the carbon dioxide that accumulates during fermentation to escape while preventing oxygen from coming in. Using an airlock helps to prevent mold and stray microbes from contaminating your kimchi, delivering superior and consistent results. Fermented vegetables are easy and fun to make when you get the hang of it. They’re also a great way to not only add variety to your meals, but to give a boost to your diet with probiotics. This Easy Kimchi Recipe is pretty simple to make. Hot Pink Jalapeno Garlic Kraut is an all-time favorite of Nourished Kitchen readers. Homemade Sauerkraut is an easy classic. Fermented Hot Chile Sauce is simple to make but explosive on the tastebuds.